Paco and Lola Archives - Write for Wine: It's Wine O'Clock Somewhere!Write for Wine: It's Wine O'Clock Somewhere! We recently attended a virtual tasting, sponsored by Rías Baixas Wine and Snooth, featuring eleven Albariño wines and noteworthy comments by Snooth’s co-founder/CEO/chief taster Mark Angelillo and Lyn Farmer, James Beard Award-winning wine & food writer. Rías Baixas Albariño comes from Galicia, located in the northwest corner of Spain, which more closely resembles coastal Ireland than it does other parts of Spain. 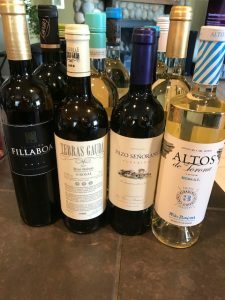 While we have enjoyed an occasional glass of Albariño in the past, it was an eye-opener to discover there is lots of variety, style, texture and diversity in Albariño wines; but they are consistently tasty with minerality, creaminess and zesty citrus, stone fruit and tropical fruit flavors. And they are very affordable.